We are investigating the potential for reintroducing vegetation into the typical PV power plant installation in drylands. Why?? We think that this novel approach may lead to increased renewable energy production, increased food production, and reduced water use! Why might this benefit agricultural plants? Plants need sunlight. The truth is, though, that plants don't continue to do increasingly well as you add more sunlight. At some point, their potential to use the sunlight for photosynthesis plateaus out, and if they experience too much light, they can actually become less productive. Think about it - plants in drylands have adapted to deal with the excessive amount of energy in lots of cool ways. Unfortunately, many of our agricultural plants are not desert adapted; we make up for this lack of adaptation by giving them plenty of water through irrigation. What if we mimicked nature? One desert adaptation is to grow the shade of another plant. How might the shade of a solar panel array overhead lead to cooler temperatures and less excessive sunlight for agricultural plants? Our preliminary work suggests that there are measurable benefits for some species! Why might this benefit renewable energy production? Larger solar installations create a heat island effect, and that is bad for the PV panels because as they get too hot, they become less efficient. Basically, there two ways for the excess sun energy that is not converted into electricity to leave the area: sensible heat (the energy you can feel) and latent heat loss (the energy used to convert liquid water to water vapor). In a natural ecosystem, this latent heat loss happens when plants transpire during the process of photosynthesis. The problem is that most PV installations don't have plants in them any longer, which means they don't have a way for sun energy to leave through latent heat loss. This means that excess energy can only leave through sensible heat loss (which is why these areas become hotter). We are trying to increase the latent heat loss from plants so that there is less sensible heat loss. Such a simple concept that can potentially have a big impact? Yeah, we had our doubts too until we tried some preliminary experiments! Why might this benefit water resources? Water evaporates away more slowly in the shade, no? If we reduce the direct sunlight hitting the soil, we believe that water from each irrigation event will remain in the soil longer to do the work we put it there to do - sustain plants! Why might this benefit people? 1. Drylands are often really hot environments, making our farm worker population prone to heat stroke and heat-related death. Our preliminary data suggests that skin temperatures can be up to 20°F cooler when working under the PV array! That makes for significantly more comfortable working conditions! 2. We have partnered with the UofA Community & School Garden Program to help educate our next generation about all aspects of STEM (Science, Technology, Engineering, & Math), while integrating art and ecology. See more about our Agrivoltaics Learning Labs below. or by visiting the News page. 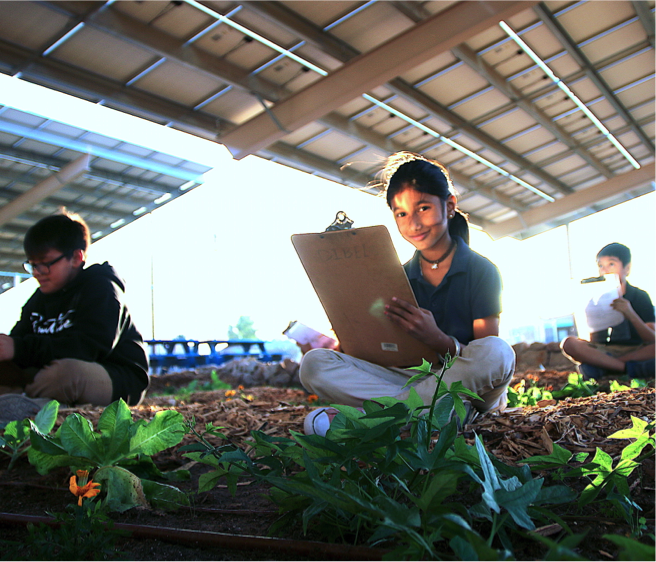 We have established a series of Agrivoltaic Learning Labs at Biosphere 2 and local schools within the Tucson Unified School District. These are becoming sites for engaged and hands-on learning by K-12 students, college students at the University of Arizona through courses we teach, college students around the country through our Research Experiences for Undergraduates program, and the visitors of all ages that visit Biosphere 2 and are interested in participating in our research as part of their tour! This project and data were supported by (1) the Water, Environmental, and Energy Solutions (WEES) initiative at the University of Arizona; (2) the Accelerate For Success Grants Program at the University of Arizona; (3) NSF EAR #1659546, REU Site: Earth Systems Research for Environmental Solutions at Biosphere 2; and (4) the Dept of Energy's National Renewable Energy Lab.